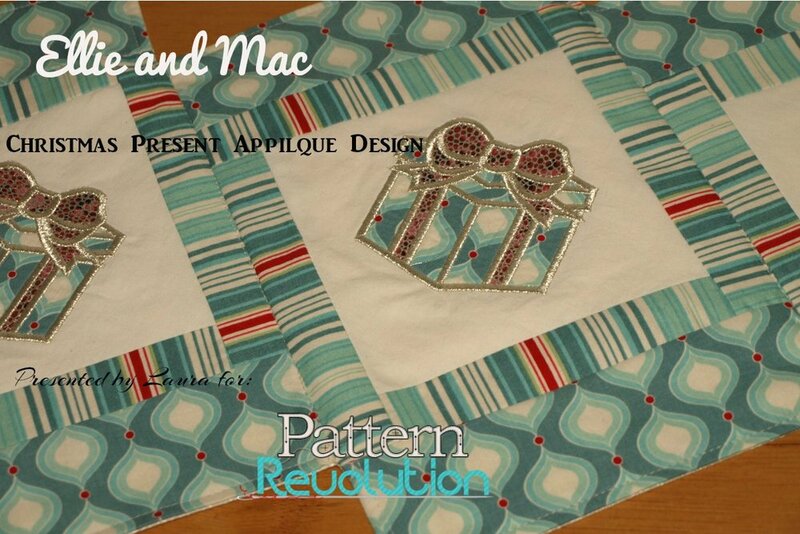 Did you know that Ellie and Mac have embroidery files in addition to their great PDF patterns? I didn’t either until recently! So, naturally, I jumped on the chance to try one out for the Christmas series at Pattern Revolution. My embroidery machine doesn’t get a workout most of the time, but I couldn’t wait to try out this design! I may have used a not-so-traditional color scheme, but I love the way the aqua looks with the tiny splash of red and I couldn’t help myself and I used a metallic silver for ALL of the embroidery, lol! (Yes, the design can be stitched with three different colors of thread, but I was curious to see how it would look in all silver.) I think these colors will look great with a white/pale tree and other decor. I made a small table runner with the blocks I stitched out, but this would also be great as a tree skirt, large table runner, quilt (especially when combined with some of the other Christmas designs), placemats, coasters/mug rugs...The choices are endless! I’m already plotting a way to make a round table runner to use for celebrating birthdays. Can’t you see a bunch of cute presents surrounding a birthday cake?